There’s also a busy port, one of many lovely inlets on the north shore of Lake Erie, where brilliant white boats bob in dark waters surrounded by deep green hills. 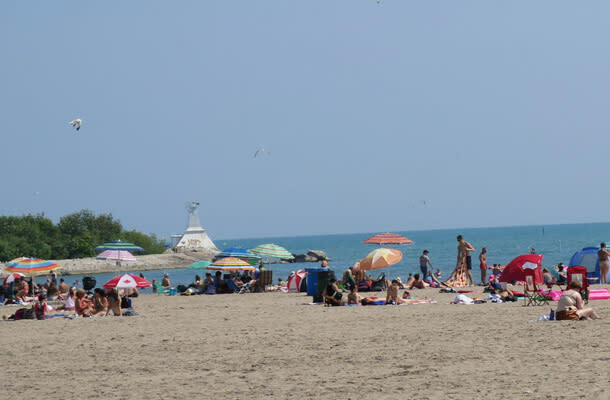 But there’s also a wild beach scene, with warm, gentle waters and endless sand and an outdoor patio where young folks in barely there bathing suits gather for a beer or three and pose for endless summer selfies. In short, this is one terrific town. 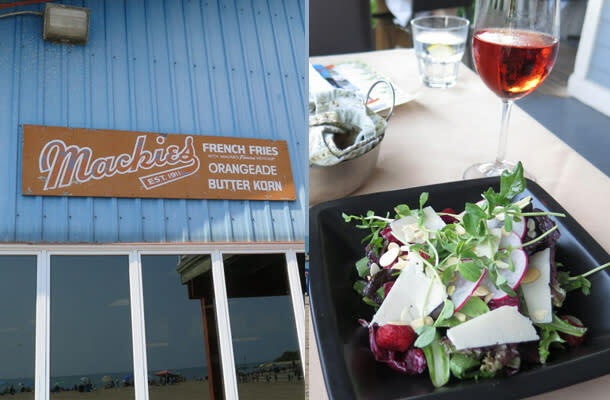 I rolled into town around lunchtime after driving in from Kingsville on day two of my “getting to know the Lake Erie shoreline” tour. I parked down at the waterfront, joining a long line of folks queuing for the parking meter, and then sauntered over to GT’s . The quesadillas could’ve been spicier (hey, we’re just about on the border of northern California here; let’s get some chilies going) but they were pretty tasty. And the patio was hot and heavy with young girls in bikinis and guys in board shorts and families downing burgers and nachos under a baking sun. Their sign says sand, suds and sizzle, and they’re right on the money on all three counts on this day. It felt a lot like a café you’d find on Clearwater Beach or Myrtle Beach. And that’s a good thing in my book. I wandered over to legendary Mackie’s, where they sell sweet orangeade and where you can buy a huge basket of fries – it looked to be the size of a small pizza box – for $8.95. That’s less than you’ll pay for a tall boy of beer at some southern Ontario golf resorts. There is, of course, ice cream, including a cotton candy flavour that I didn’t get around to trying. If you stand in line for a minute, and you probably will in summer, you can scan through a great book at the cash counter that shows the old days in town, with model A’s lined up in front of an old bath house and photos of the incline railway they used to have to run folks up and down the hills in town. 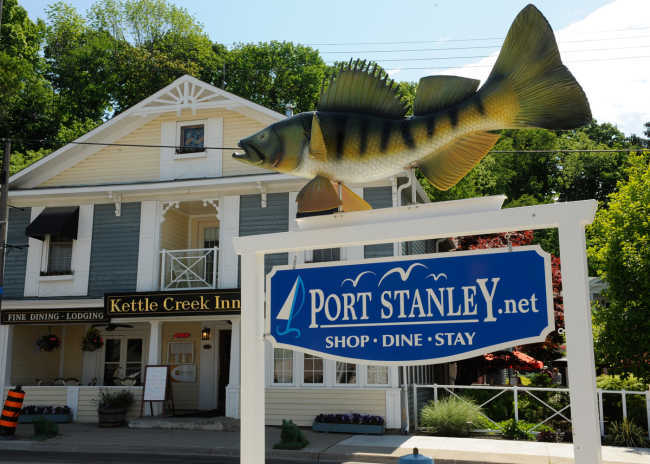 This was a major arrival port for immigrants coming to Canada in the middle of the 19 th century, and Port Stanley was the busiest port in Canada at one time. There’s a plaque in town that explains how former Ontario Premier Mitchell Hepburn once worked on a bank on Main Street and would sometimes dance the night away down near the water in a place that boasted the largest dance floor in the country. As much as I loved the beach, I was equally taken by the people I chatted with in the stores on Main St., which strikes me as a less precious version of Port Carling in Muskoka. It’s cute, but not overly taken with itself. I ask how the name Barb’s Brickle came about and she said the son of a friend of hers was trying it out. A couple short blocks from the beach, I pull into The Windjammer Inn, which dates to 1854. I have a large, lovely room with all the amenities I need on the second floor, where I find great old books to read and a refrigerator to keep my Oxley Estate wine cold and a coffee maker and a TV. I settle in for dinner on the lovely, wraparound porch (they have far too many of these in this part of Ontario and it drives me insane with jealousy) on a warm July night and wolf down a fabulous salad with greens, radishes, strawberries, almonds, and more. My risotto comes with three types of green peas, plus parmesan cheese and perfectly cooked scallops and shrimp. My friendly and knowledgeable server tries to tempt me into dessert but I settle for a good cup of coffee and a nighttime stroll down to watch the moon dance on a dark and quiet Lake Erie.